This recipe comes courtesy of The Complete Mediterranean, The Beautiful Cookbook. There are several variations of this recipe shown below. In a large skillet over low heat warm the olive oil. Add the garlic and fry gently until translucent, about 3 minutes. (don't let the garlic burn. 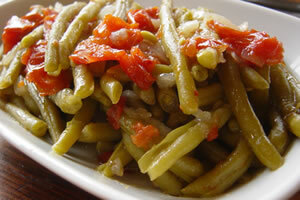 If it does, start over, burned garlic will ruin any dish) Add the green beans and tomatoes. Add salt and pepper to taste. Lower the heat and cook approximately 15 minutes, until the beans are tender. Variations: Another Tuscan variation of this recipe calls for the addition of one teaspoon of fresh marjoram, which we'd suggest you add right at the end of cooking for the freshest flavor. For a Lebanese flair you can use tomato paste in place of the chopped plum tomatoes and add parsley, mint, dill or oregano to taste.